Displays audio status and wallpaper, and allows you to go to various setup options. Press DISPLAY button. 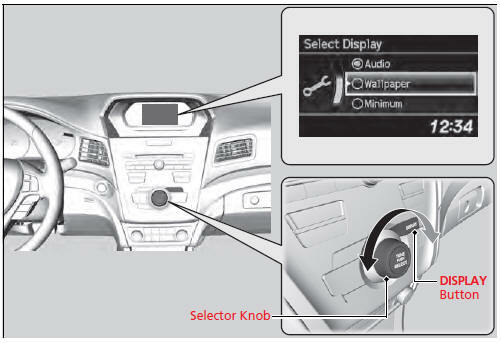 Rotate and select the mode from the three display modes. Shows the current audio information. Shows a clock screen or an image you import. Minimizes the display by only showing the clock and audio status on the display. 2. Rotate and select the setup option you want to change. Press . 1.Rotate to select Language Selection, then press . 2. Rotate to select the language, then press .